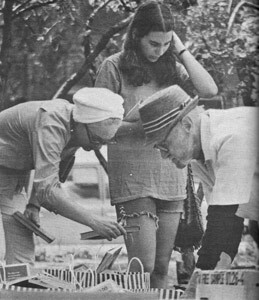 On Saturday, August 15, 1970, the Friends of the Oak Park Public Library held their first used book sale to raise funds in support of the library. Approximately 8,000 books were sold during the one-day event held in Scoville Park. The Friends raised $1,525 that was earmarked for the purchase of a soundproof booth and electronic equipment to record books on tape for use by the blind. The chairperson was Mrs. Henry (Sherlynn) Reid, and Mr. and Mrs. Joseph Kahovec served as general coordinators. From its humble beginnings, the sale has grown into a much-anticipated summer event. On August 3rd and 4th at the 42nd Annual Book Fair held at Oak Park River Forest High School, the Friends of Oak Park Public Library offered 100,000 books in every conceivable category. The sale raises about $50,000 each year.